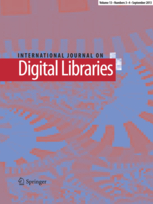 Selected TPDL 2017 papers will be considered for publication in the Special Issue of International Journal of Digital Libraries, Springer Journal. Αuthors considered for the special issue will be required to submit extended versions (at least 30% new material) of their papers that expand upon the description of their work by providing more depth and detail on their technical approaches and results. These submissions would then go through the IJDL review process before acceptance. Page length of a regular paper is expected to be between 10-30 pages.